Jay Austin and Lauren Geoghegan documented how their long cycling journey was a chance to live an open-hearted life and to embrace the notion that the world was overwhelmingly good. 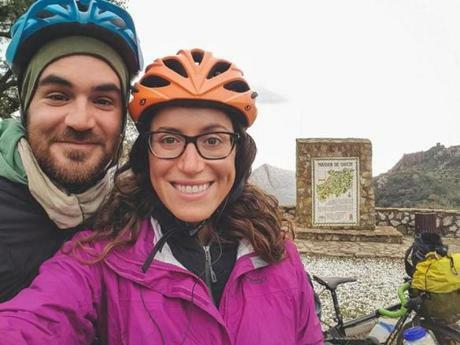 Asked why they had quit their office jobs and set off on a biking journey around the world, the young American couple offered a simple explanation: They had grown tired of the meetings and teleconferences, of the time sheets and password changes. 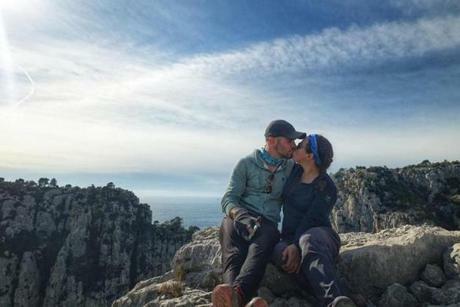 “There’s magic out there, in this great big beautiful world,” wrote Jay Austin who, along with his girlfriend, Lauren Geoghegan, gave his two weeks’ notice last year before shipping his bicycle to Africa. They were often proved right. On Day 319 of their journey, a Kazakh man stopped his truck, said hello and handed them ice cream bars. In a meadow where they had pitched their tent on Day 342, a family showed up with stringed instruments and treated them to an open-air concert. And on Day 359, two pigtailed girls met them at the top of a pass in Kyrgyzstan with a bouquet of flowers. There were hardships, too, including punctured tires, snarling dogs, freezing hail, and illness. But for Austin and Geoghegan, both 29, these were far outweighed by moments of human connection. Jay Austin and Lauren Geoghegan. Then, on July 29, came Day 369, when the couple were biking in formation with a group of other tourists on a panoramic stretch of road in southwestern Tajikistan. It was there that a carload of men who are believed to have recorded a video pledging allegiance to the Islamic State group spotted them. A grainy cellphone clip recorded by a driver shows what happened next: The men’s Daewoo sedan passes the cyclists and then makes a sharp U-turn. It doubles back and aims directly for the bikers, ramming into them and lurching over their fallen forms. In all, four people were killed: Austin, Geoghegan and cyclists from Switzerland and the Netherlands. It was a worldview as diametrically opposed as imaginable to the one Austin and Geoghegan were trying to live by. 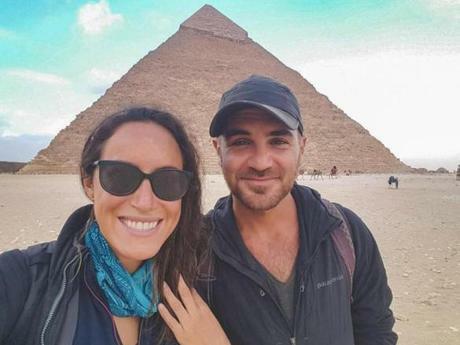 Throughout their travels, the couple shared Instagram posts about the openheartedness they wanted to embody and the acts of kindness reciprocated by strangers. Back in Washington, where the pair met, Austin lived in a tiny house, an experiment in the principles that eventually led him to his journey around the world. After earning a master’s degree from Georgetown University, he began working at the US Department of Housing and Urban Development. Convinced that many of the belongings people accrue are unnecessary, he began adopting a minimalist lifestyle, said his childhood friend Ashley Ozery. He built a house, nicknamed “The Matchbox,” that was so small — just 140 square feet — that it was profiled on numerous TV shows. To free up space, the walls were constructed with built-in magnets, so that he could store metal objects by sticking them to the paneling, like his spice collection. If one of his goals was to pare his life to the bare essentials, another was to enlarge his world. Because he had no mortgage weighing him down, his miniature house meant that he could take unpaid leave from his government job and travel the globe. The couple visiting the pyramids in Egypt. First, he took a scooter trip around the United States. That was followed by a rail voyage in Europe. Next came a stint in Namibia. Then it was a weekslong trip across India, said Ozery, who became friends with Austin in 1999 at their elementary school in Manalapan, N.J. In 2012, he met Lauren Anne Geoghegan, a native of Southern California, who like him had graduated from Georgetown and was now working in the college’s admissions office. “Outside-the-box.” “Challenges me to grow.” “Adventurous.” That was how Geoghegan described Austin to her closest friends, said Kristen Bautz Robinson, who had known her since their first year at Georgetown. Although Geoghegan, too, was a seasoned traveler — she had spent a summer in Beirut learning Arabic and a semester in Madrid becoming fluent in Spanish — the rugged, do-it-yourself journeys that had become Austin’s hallmark were new to her. 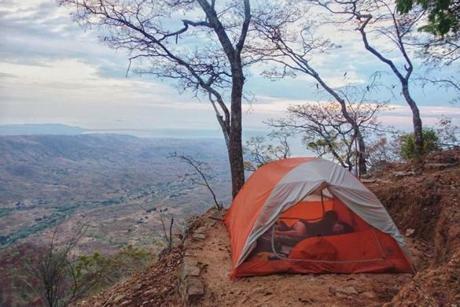 A campsite in Malawi pitched by Jay Austin and Lauren Geoghegan. His values began to rub off on her, say her friends. She bought a bike-share day-pass, which turned into an annual membership. Soon she purchased her own bike. Austin was a vegan. Geoghegan became a vegetarian, said her close friend Amanda Kerrigan. If the plan seemed far-fetched, the couple was methodical in their planning. They did a monthlong test-run in Iceland, cycling across its valleys. And since they had to carry everything themselves, they focused with laserlike attention on each object they planned to bring. One reporter who dropped by to write a profile of Austin found him in front of a scale, weighing the possessions he planned to pack — hat: 2 ounces; tablet: 11 ounces. They spent months saving, but then it was time for big decisions: The trip was not one that could be covered by an extended leave. “I quit my job today,” Austin posted the month before their departure last summer. The day Geoghegan and Kerrigan said goodbye, the two friends hugged outside Geoghegan’s apartment. “The minute your instinct tells you something is wrong — leave,” Kerrigan told her. She was concerned for her friend, in part because of how big-hearted she was and in part because she feared that Austin had a higher tolerance for danger than Geoghegan did. The couple began their voyage at the southernmost tip of Africa with a miscalculation that left them stranded. It was July 23, 2017 — winter in South Africa, when the sun sets at 5:30 — and they had not realized how far they would need to travel on congested freeways before they could get out of Cape Town. At dusk, they found themselves with a punctured tire on the chaotic R27. There was nowhere to pitch their tent except for a ditch adjacent to the busy freeway. In a post about why he chose to cycle — as opposed to, say, drive around the world — Austin spoke about the vulnerability of being on a bike. “With that vulnerability comes immense generosity: good folks who will recognize your helplessness and recognize that you need assistance in one form or another and offer it in spades,” he wrote. In the middle of the night, a security guard patrolling the grounds of a nearby nuclear plant spotted their tent. He radioed for help and arranged for a truck to drive them across the city to a campsite. A hotel in Almaty, Kazakhstan where Jay Austin and Lauren Geoghegan stayed. Their journey was a series of tedious, and occasionally grueling, physical tests, punctuated by human kindness. They continued north, crossing deserts where the sand was so deep they had to dismount and push their bikes. In Botswana, a concerned man stopped his car to offer them ice water as they pedaled in 95-degree heat. They cycled on dirt paths, through dry riverbeds and on cracked asphalt, going days without a shower. In Morocco, a family offered the couple a room, and then sent them off the next morning with homemade bread. Days turned to weeks, and then into months. Their bodies began to break. An ear infection landed Geoghegan in the emergency room in France. They both contracted pinkeye. They shouldered on through upset stomachs and sore throats. It was winter by the time they reached Europe last December. Torrential rain soaked through their waterproof gloves. “Utterly hopeless, wet and cold,” they posted from Spain. 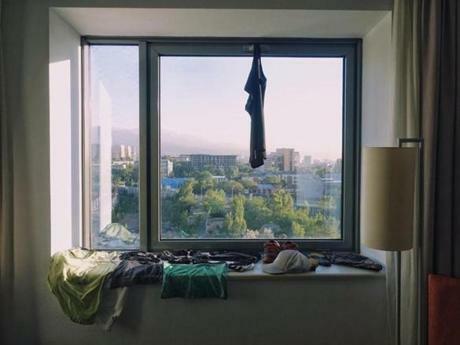 A few hours later, a couple in a white van stopped, handed them a towel and insisted on driving them to their house, where they dried their sopping clothes in the dryer. But in the course of their travels, their blog posts also noted flashes of cruelty. On one mountain pass, a group of men blocked their path and tried to shove the couple off their bikes. And just 50 yards from the Spanish border in bumper-to-bumper traffic, Austin signaled to a driver that he wanted to cut into his lane. The driver let him enter and then — slowly and deliberately — began to run him over, trapping Austin’s bike between the advancing car and the vehicle ahead of them. Still, by the time they reached that bend in the road in Tajikistan just over a week ago, they had embraced the notion that the world was overwhelmingly good, the dozens of annotated photographs and the thousands of words they left behind show. 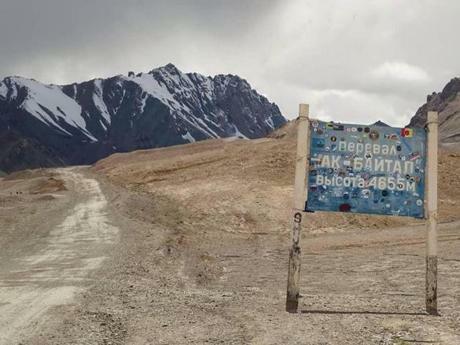 The Ak-Baital Pass in the Pamir Mountains of Tajikistan. “You read the papers and you’re led to believe that the world is a big, scary place,” Austin wrote. “People, the narrative goes, are not to be trusted. People are bad. People are evil. “No greater revelation has come from our journey than this,” he wrote. In the video released by the Islamic State after the couple’s death, the men pledging allegiance to the group can be seen sitting on a stone slab, an aquamarine lake partially visible over their left shoulder. It is the kind of panorama that the young couple might have stopped to capture and post on his blog. But in the clip, when these men point to the scenery around them, they vow to slaughter the “disbelievers” who have overrun their land.